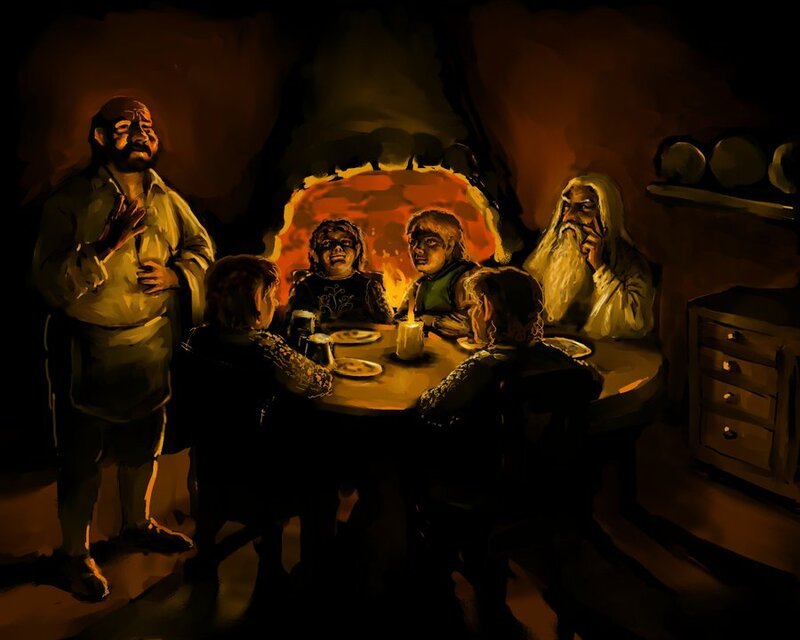 The Bree folk were always there…or so they say. 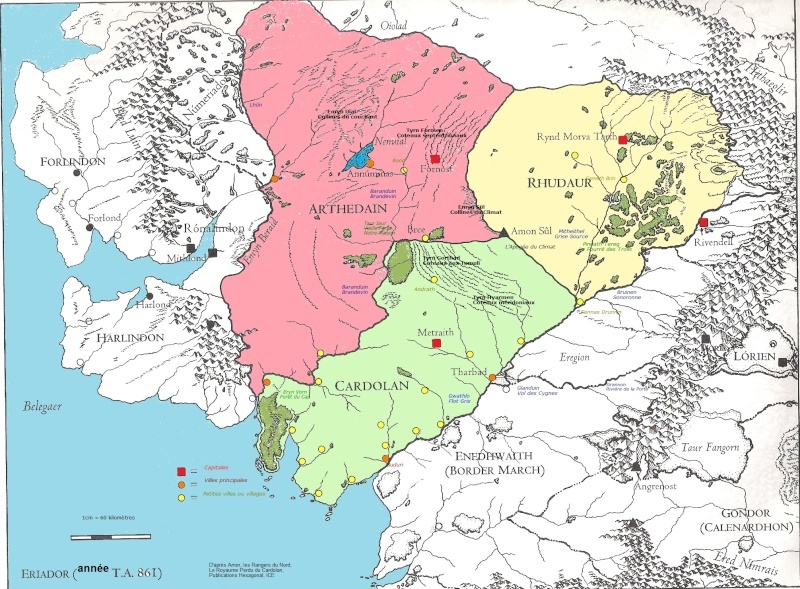 The Lord of the Rings tells us that, according to their own tales anyway, the Men of Bree were the original inhabitants and were the descendants of the first Men that ever wandered into the West. This might put them somewhere in the same family as the Elf-friends or Edain…but I don’t believe that. More like as not they’re some kindly, drunk, agricultural offshoots of some Easterling band or other. And most sources seem to put them in the same line as the Dunlendings, albeit separated by the centuries and made more fat and less warlike. We also learn from the Lord of the Rings that their home, the village of Bree, had some hundred stone houses along with a few Hobbit holes for good measure. Of course, all that really matters for most of us is that Bree-town holds a very special Inn. Bree doesn’t come into play until the events of the great years. Not unlike it’s physical geography, Bree is nestled into its own pocket of history; weathering the storms of many an Age. Even when it was part of the great northern Kingdom of Arnor and later Arthedain (or was it Cardolan), Bree remained staunchly independent, seemingly oblivious to the great goings-on in its midsts. But the negligence paid off, some would say, as Bree bent but did not break and remained the final remnant of civilization between Rivendell and the Shire. Similarly the Hobbits and Men of Bree, despite open interaction and friendly relationship with traveling bands of elves and dwarves, seem oblivious of the world without. They haven’t survived as long as they have by meddling in the affairs of wizards (or anyone else for that matter), so they don’t. If the exit of four Hobbits and a Ranger is enough to empty Bree and Archet and Combe and Staddle just for a peak, we get the idea; Bree-folk don’t get out much. Sound familiar? It should be; if Hobbits are based on the rural folk of the West Midlands, then Bree-landers are just a degree removed. But in spite of their proximity (less than a days ride) there are very few travelers between the Shire and Bree. I’ts an insular life but one well lived. Intrinsically tied to the Pony is its owner and proprietor, Barliman Butterbur. You can’t see old Barli without realizing his great importance to the history of literature. Well, fantasy literature anyhow. If you’ve ever read any medieval fantasy novels subsequent to Tolkien you know the stereotype of the innkeeper. Fat, bald, rambling, busy, flustered, quaint…basically everything Barliman is. I like Barli because he serves that great theme of Tolkien’s work, where even the smallest of things influence and change the great workings of the world. 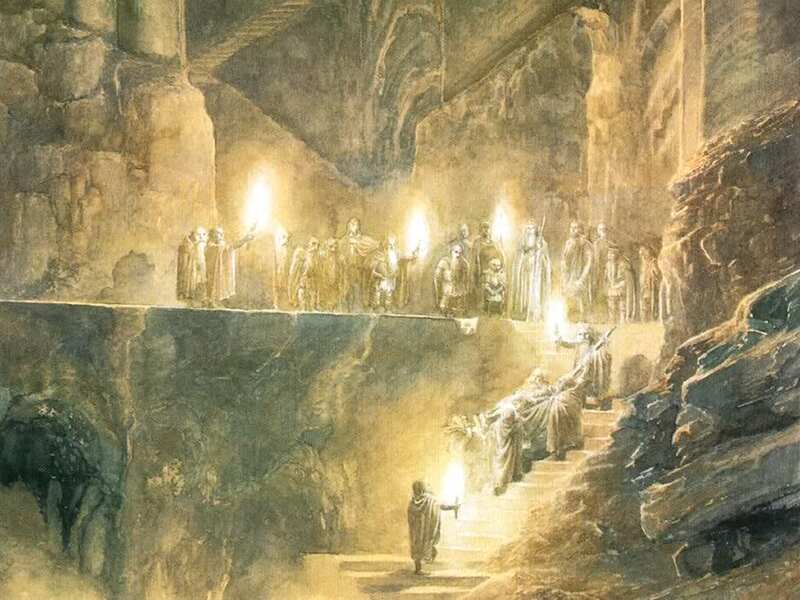 Despite his forgetfulness and hasty mind, he still manages by providence to help keep Frodo and the Ring from danger once they have made it to his fine abode. Furthermore his place, as the only meeting hall on the Great Road, has chipped the boulder of history in its own way. Think not only of Frodo or Strider, but of Gandalf and Thorin, their chance meeting that became the drip that became the flood of the events of The Hobbit. What better setting than this? It is also symbolic as a kind of gateway. Even though things get gnarly beforehand, thanks to the Old Forest and Barrow-downs, most agree that the Hobbits aren’t really into it until they pass through Bree. It’s here that the Black Riders catch up to them and the threat of Mordor and the Ring become real for the first time. It’s also where Strider and all the history that comes with him is met. The reverse is true as well: after a year of war and toil and danger, the four Hobbits and Gandalf leave the rest of Middle-earth to return to the Shire, but not before visiting the Pony and learning that trouble has come to Bree and the Shire. It’s kind of inverted. At the start, the Shire and Bree were (for the most part) safe as they’d ever been and the rest of the world was under an imminent threat. 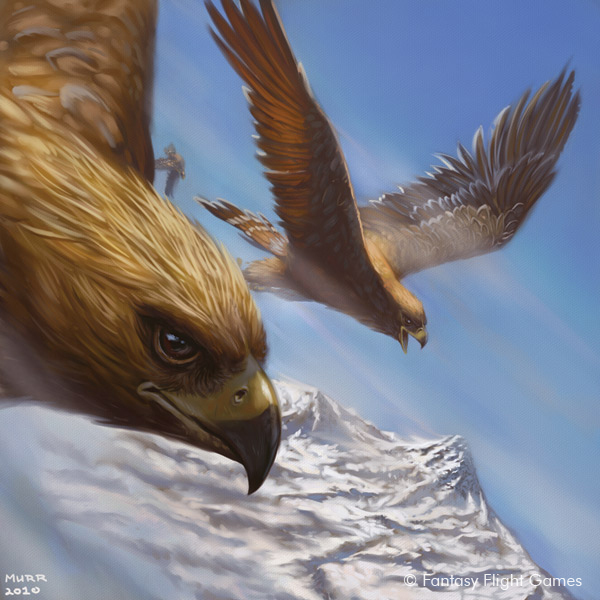 On the return journey that appears to be flipped around and the hobbit heroes must complete their great task at home, and the folk of Bree must defend themselves against violent brigands. Besides its internal importance as both a sanctuary and a convenient plot device to provide a neutral meeting place, the Pony, not unlike Barliman, quickly became a standard fantasy trope. 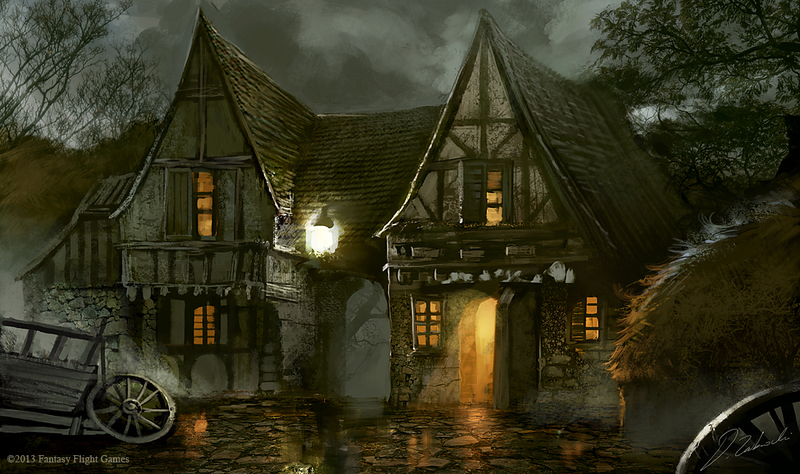 The smoky, friendly inn where heroes confer and refresh themselves is apparent in just about every contemporary fantasy setting, especially D&D. 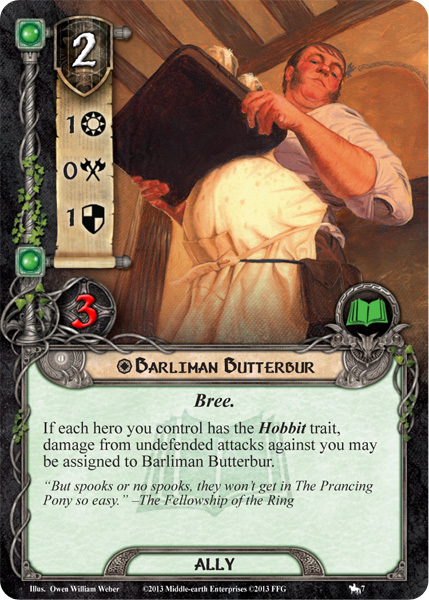 In The Lord of the Rings the card game the players really make only a brief stop there in the second quest of The Black Riders saga expansion, abstracted as some free allies popping in (because, you know, they were just waiting at the Inn). We say on The Grey Company Podcast sometimes that locations seem to have gotten the least amount of ‘love’ in the game, and so the Pony is hung out to dry, so to speak. Then again, the game is not about conferring around pub tables, but what happens after. The journey, the adventure, the Road. Still, it’s nice to know there is always a merry old inn to come home to. I actually really like the design of The Prancing Pony as a location, which gives you that benefit, but also a nasty drawback to deal with, so you have to choose carefully when to travel there. I suppose, though, that the true flavor of a place like The Prancing Pony could only be replicated by an RPG. Speaking of which, as you mentioned in the article, inns and taverns have become the cliched spot for RPG’s and stories to begin. I have fond memories of that tavern where the Dragonlance novels began after all! The design is very thematic, as there are enemies at the Pony who will track the company as they leave. And three cheers for the Red Dragon Inn!